It's no secret that we love Kodi here at Cordcutting.com. Kodi was organizing media before our favorite streaming boxes even existed. It runs on almost everything, from “jailbroken” Amazon Fire TVs to tiny Raspberry Pis. And it's polished and slick, yet almost endlessly customizable. 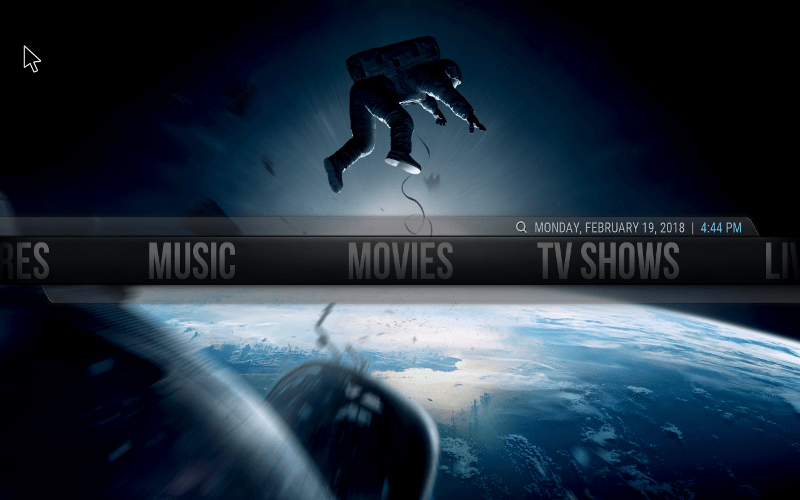 It's easy to change the feel and look of Kodi thanks to its huge supply of skins. The best skins do more than just change the look of Kodi – they can do things like rearrange menus and add dynamic features. Choosing the best Kodi skin for your needs is a matter of personal preference, of course, but there's no denying that some skins are more popular than others. Today, we're here to share our picks for the best Kodi skins. 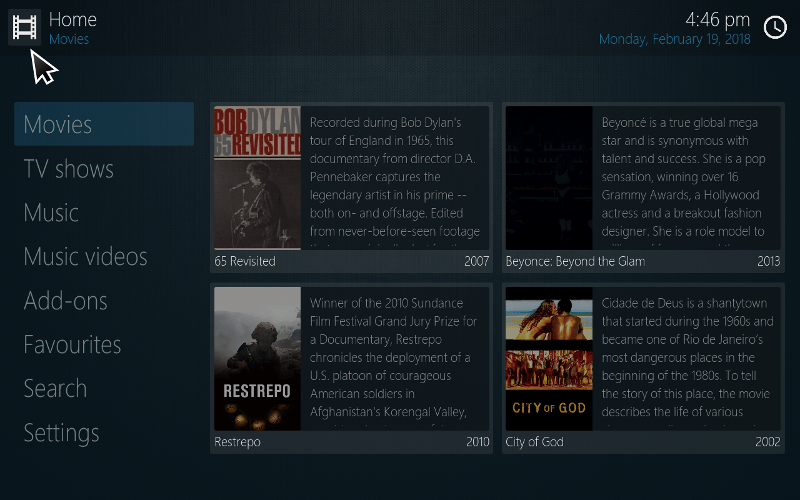 As we make our way to our list, we'll also show you how to change your Kodi skin. It's easy enough to do, and once you know how to change Kodi skins back and and forth, you may find yourself trying all kinds of different options. And if, in the process, you decide you disagree with our list of the best Kodi skins, feel free to let us know in the comments! Showing you our picks for the best Kodi skins won't do much for you if you don't yet know how to change your Kodi skins. So let's start by covering how to change Kodi skins within Kodi's menus. It's quite easy to do! Start by opening Kodi, of course. If you've never changed Kodi skins before, you're probably looking at Estuary, the default skin for Kodi (if you're not, it's because you don't have the latest version of Kodi – Estuary has been the default skin since the release of Kodi v17, or “Krypton,” in February of 2017). But no matter what Kodi skin you're using, your main menu should feature options like “Videos,” “Music,” and “Add-ons.” It should also include some way to access the system/settings menu. In the case of Estuary, Kodi's current default skin, this is the gear icon under the Kodi logo at upper left. In Kodi's menus, click the gear icon to reach the System menu (some skins label it Settings instead). 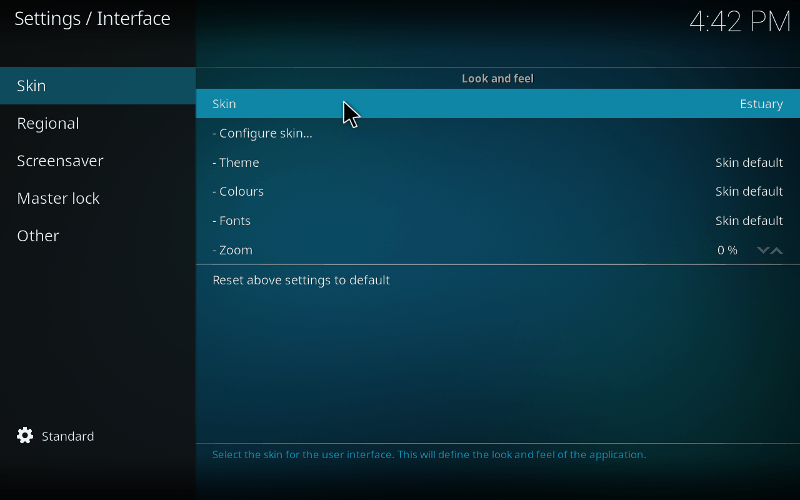 Then navigate to Interface Settings > Skin. Click Skin (the one on the menu, with your current skin – probably Estuary – listed across from it). Here, you'll see all the skin options you have. Pick one to swap your current skin. That's it – you know how to change your Kodi skin now! …But if you've never taken an interest in skins before, you may not be blown away by the selection. What's going on? Well, Kodi has a ton of skins, but not all of them are downloaded automatically. To get more, we're going to have to pick out the ones we want to download. So let's continue with our steps and learn how to get Kodi skins and how to change Kodi skins to new, freshly downloaded options. See the option labeled Get More? Yep, that's the one we want. Select that and start browsing skins. Pick one from our list of the best Kodi skins (below), or choose your own adventure! 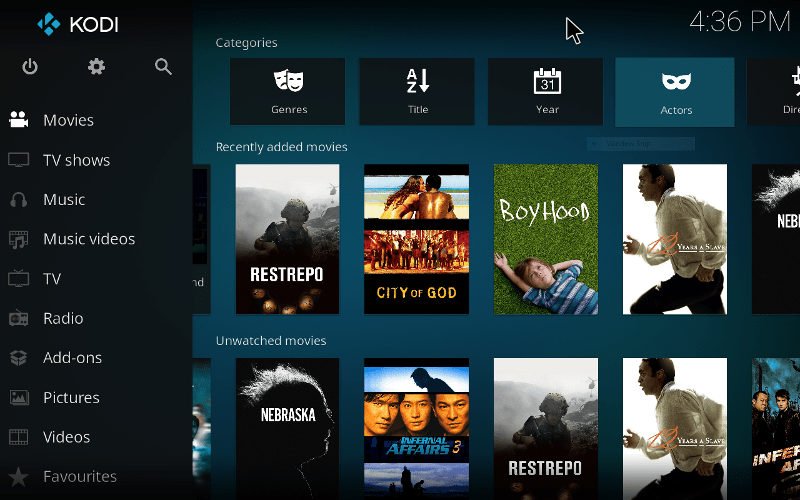 Selecting a new Kodi skin will download it to your device, but these aren't huge files – if you want to try out a few, you should! 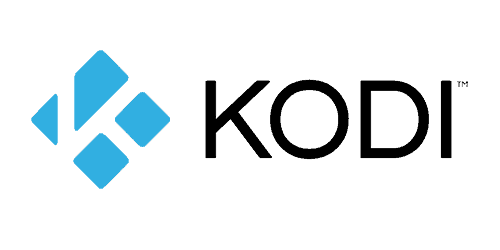 When you select and download a new Kodi skin, Kodi will ask you if you want to install it. Go ahead and say YES if you want to. Once you have a few options you like, it's easy swap skins in the menu. You remember how to change Kodi skins, right? It's just Appearances > Skin > Skin in Kodi's menus. From there, you can see your different Kodi skins and change Kodi skins quickly, or you can once again hit Get More and explore new options. And if you're looking for some good options, we have some recommendations coming up next in our list of the best Kodi skins! Every Kodi skin has its own group of fans, but we're going to play favorites in this post. Having showed you how to change Kodi skins, we're now going to make the case for which Kodi skin to use – or, at least, we're going to give you a selection of a few that we consider really top-notch. These are our picks for the best Kodi skins. Aeon Nox has been a staple of our Best Kodi Skins post for years, and it's not hard to see why. Aeon Nox knows what people love about Kodi, and it's a skin that is determined to give the people what they want. And what do the people want? To customize their experience, of course. Now that you know how to change Kodi skins, you may want to swap skins constantly in search of the perfect fit. But Aeon Nox doesn't want you to move on too quickly, and it offers you a wealth of ways to customize things within the Aeon Nox skin. You can change almost anything within Aeon Nox. Swap the fonts and colors to create a different feel, or get more drastic and change big things – like the options on the main menu! The latter makes Aeon Nox a great choice for specialty projects and those who use don't use Kodi for certani things (e.g. music) and want those options cleared out. Put it all together and you have a powerful, flexible, and beautiful skin. Aeon Nox finds a way to be the best Kodi skin for all sorts of different people, because it never needs to look the same way for the same people. No wonder, then, that it's a perennial entry on any respectable list of the best Kodi skins and a frequent winner of fan polls. Last year, we wrote that Arctic: Zephyr “[wasn't] quite the superstar skin that some of the others on this list are,” but that we had “a soft spot for it.” But, apparently, we weren't the only ones – and this year, few skins can claim to be more respected than Arctic: Zephyr, which is now even more of a staple of best Kodi skins lists than it was last year. Arctic: Zephyr manages to balance a soothing and minimalist feel with screens that contain lots of options and information. It works really well on streaming boxes and on touchscreens, and may be one of the best Kodi skins for Fire TV Sticks and Fire TVs. (Kodi is not officially supported by Fire TV devices, of course, but in the past we've showed you how to jailbreak a Fire TV by sideloading Kodi.) It's not, however, as good for those who want to use a mouse. Confluence was the default Kodi skin for years until Estuary came along and stole its crown. But it was included in our list of the best Kodi skins even when it was the default skin, and it retains its position today. Confluence is simple and functional, and it makes Kodi easy to use on a wide variety of platforms, from laptops and desktops to smaller touchscreen devices. Longtime users are particularly likely to be fans of Confluence – after all, it was Kodi's default skin for years! So if you recently made the jump to Krypton but find yourself longing for the Kodi of yesteryear, the best Kodi skin for you might be Confluence. 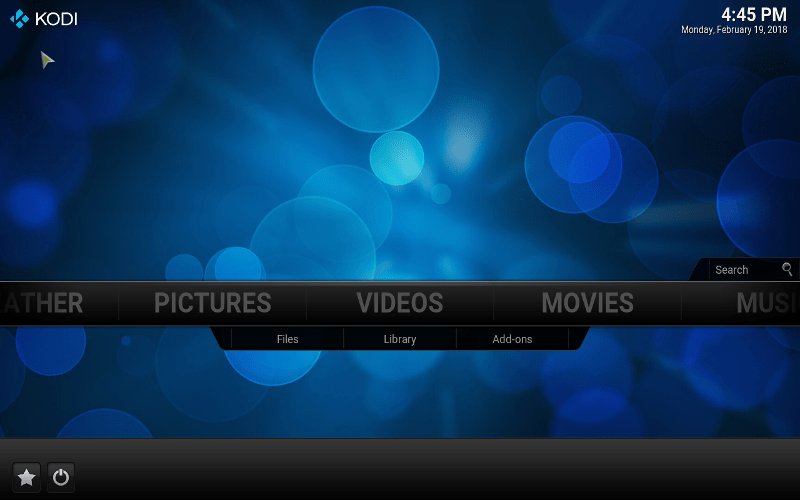 Part of the joy of Kodi is the ease with which you can customize it. We showed you how to change your Kodi skin above, and between the simplicity of that process and the huge supply of skins available for Kodi, it's easy to get carried away and try out all sorts of different Kodi skins. Still, don't be surprised if you find yourself coming back to Estuary again and again. 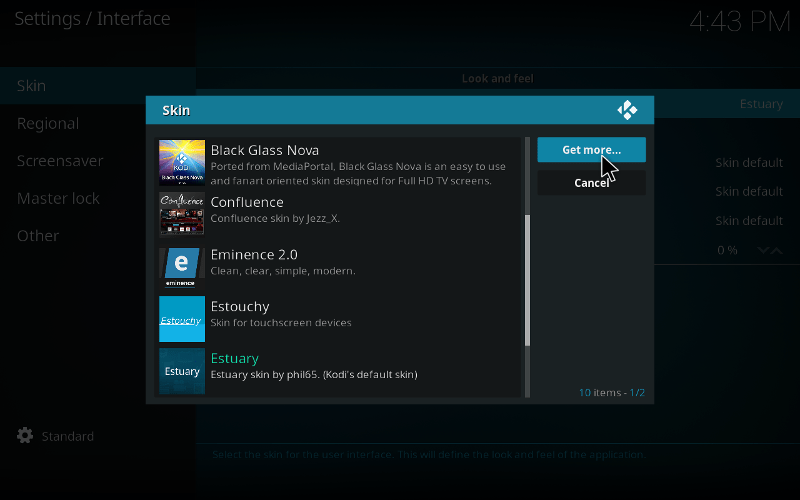 Kodi's default skin since 2017, Estuary boasts some gorgeous features and benefits from the attention lavished on it by Kodi's development team. Estuary is also easily customized, meaning you can tweak Kodi's look without changing your Kodi skin. Tweaking the color scheme is one easy way to make Estuary your own without losing its smart, attractive layout and powerful perks. Mimic is simple, beautiful, and just works. It's also quite customizable, especially considering the huge range of devices that you can use it on. Some of the biggest and baddest entries on this list of the best Kodi skins are too much for lightweight devices and are best used on desktops, laptops, and other more powerful machines. That's not the case with Mimic. Mimic might not be quite as customizable as some – Aeon Nox, for instance, has more options – but there's a lot that it can do, and its lightweight nature allows it to bring that customization power to a broader range of devices. Mimic is one of the best Kodi skins for less powerful devices, and that's one reason that it made our overall list of the best Kodi skins. I am a Roku user. Could you compare Kodi versus Roku? Thomas Nichols, the question is: can Roku be customized and can you add your own apps without restrictions? 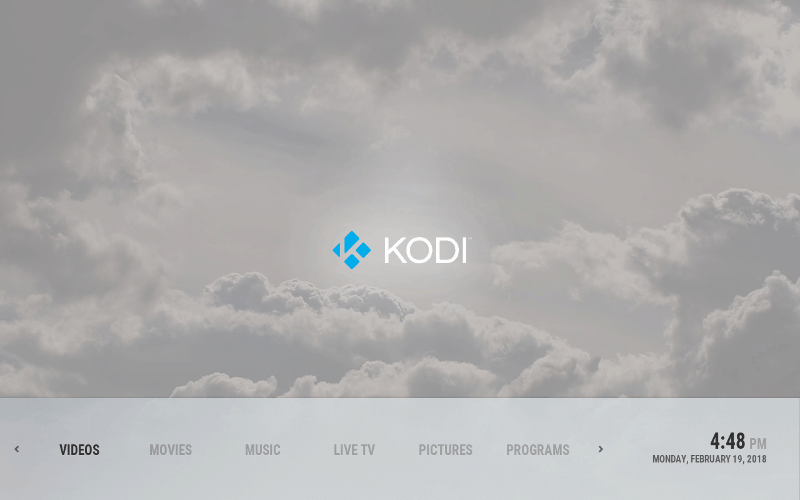 Kodi is software, Roku is hardware. Comparison done.